Time to sell your condo in the Landing? Read about today's resort-market buyer. The Landing condos are located in the popular West Beach area of downtown Gulf Shores, AL and offer direct access to Little Lagoon. The Landing condos sit just past the West Pass bridge in Gulf Shores that has just been dredged to allow larger vessels passage in to the Gulf of Mexico. The Landing condos are approximately 4 - 5 miles West of the public beaches and the Gulf Shores Hangout. The condos are only 10 - 15 minutes from Orange Beach, AL and close to a variety of local restaurants, shopping outlets and entertainment venues in Gulf Shores and Orange Beach. Property amenities at The Landing include a community pool, first come, first served boat slips, fishing pier, BBQ area, and covered parking. The complex features a small sandy beach along the lagoon making it a great spot for launching kayaks or paddle boards. For a more comprehensive collection of information, including revenue info, interactive Google maps, aerial images and videos, square footage prices and other helpful sales info for every building in town, visit condos for sale in Gulf Shores, AL. Please let us know if you would like additional info for The Landing such as, pictures, condo association rules, recent sales figures by emailing info@condoinvestment.com or call (251) Area-Pro (251-273-2776) for immediate assistance or to schedule appointments to view current listings in the Landing condos or other properties in the area. CLICK HERE to read how we increase and create client bookings / rental revenue using our network of condominium websites, social media and online affiliates. This service is completely free and only for our clients. 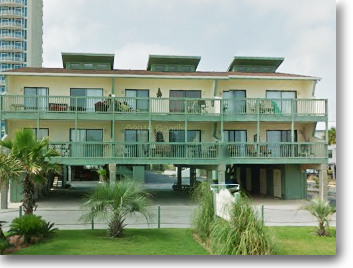 Find annual rental incomes for The Landing and all other Alabama Gulf Coast condos.